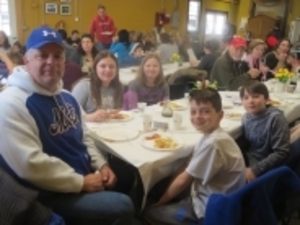 All are invited to support Hilltop Hanover Farm, White Oak Farm, and Hemlock Farm as they jointly celebrate New York State’s “Maple Fest Weekends” on Saturday, March 23; Sunday, March 24; Saturday, March 30; and Sunday, March 31. Invited guests will enjoy a hot breakfast at Hilltop Hanover Farm and then drive to White Oak Farm – only a mile away - to witness a free maple syrup demonstration. Then they can travel to Hemlock Hill Farm where the bacon and sausage for the pancake breakfast are prepared. Breakfast, which consists of freshly grilled pancakes, maple syrup produced at White Oak Farm, bacon and sausage (produced at Hemlock Hill Farm), juice, and hot beverages, will be served at 9:00, 10:00 and 11:00 each morning of the four days at Hilltop Hanover Farm (1271 Hanover St., Yorktown Heights). Make your reservation now at www.hilltophanoverfarm.org. All Four dates were sold out last year so don’t delay in making your plans. The cost of this fundraiser is $10 for adults and $8 for children, under 2 are free. Scout groups are invited to attend. While at Hilltop Hanover Farm you can also visit the farm stand, hike the two trails, enjoy the dwarf goats and chickens, and/or take photos of this beautiful 180 - acre property in northern Westchester County. Plus, you can view fully operational antique farm equipment provided by the Yorktown Grange. Added to this year’s farm list is Hemlock Hill Farm, located at 500 Croton Ave, Cortlandt Manor. It’s only a ten minute ride from Yorktown. There you can purchase hormone and antibiotic free foods available at its market year round. Visit its website for more information: www.hemlockhillfarm.com.